For centuries, the Asian elephant was regarded as a cultural icon of India. But now, a large number of farmers and civilians view the giant land mammal to be a pest. 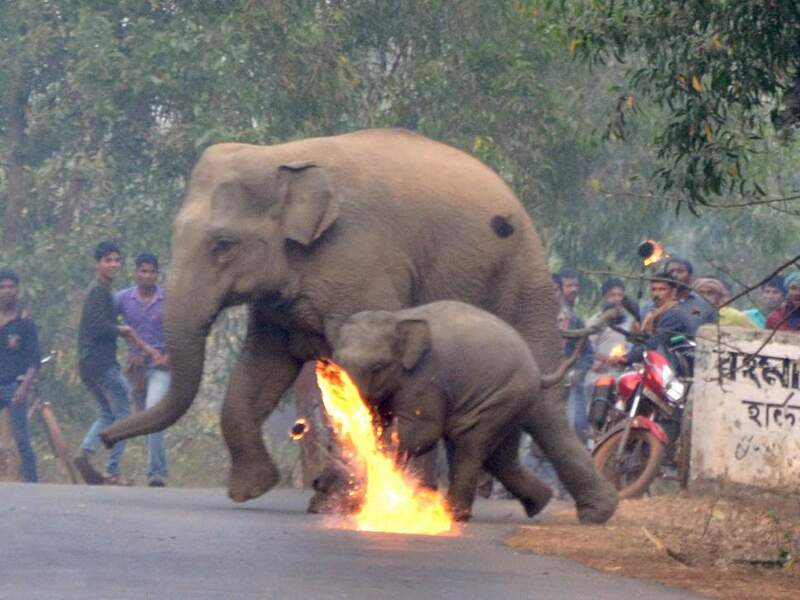 This was again made evident when a mob of people in an Indian village brutally attacked an elephant and her calf with firebombs. Two photographs recently surfaced showing elephants crossing a road. Behind them, an angry mob of men can be seen launching flaming missiles at the fleeing pachyderms. As reported by The Independent, the incident occurred in the village of Bishnupur, a remote settlement in West Bengal. The compelling photographs were captured by Biplab Hazra. His goal being to showcase violence against the endangered species as it attempts to survive in smaller and more fragmented habitats. Sadly, encounters of the sort captured in Hazra’s photographs are becoming increasingly common. The primary cause of conflict? Deforestation. As land is clear-cut, wild animals are left with less and less space to live. This is causing them to venture into territories occupied by humans. As the images reveal, villagers are going to extreme lengths to drive elephants from their fields. 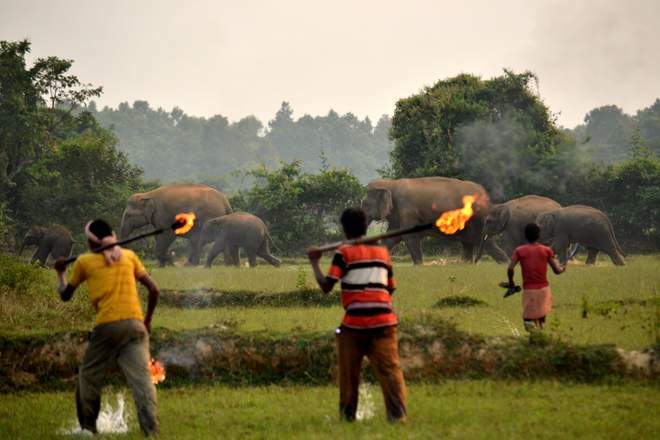 The land is their livelihood, so one can understand the desperate attempts to scare away the elephants. However, to the observer, it is clear they, too, are simply victims of urban expansion. Each day, elephants spend up to 19 hours foraging for food. During this time, they also produce 220 pounds of feces. The elephant is a gargantuan land mammal that requires ample space to roam freely. If this need isn’t met, the elephants will continue to search for food elsewhere. This reality needs to be realized by all, not only the Indian villagers who rely on the elephant’s dung to germinate their crops. To survive into the 22nd century, mammals will need the help of humankind. Discovering a tactic to resolve these conflicts is of the utmost importance. Otherwise, elephants — both African and Asian — may one day only exist in history books.